I have to admit…it happened quite quickly and yet, I’d been working at it for years! I needed to make money. After a divorce, a return to school and the start of a new business…I realized that my talents needed to be spread out into a lot of different areas in order for me to have enough income each month. I couldn’t focus on just one thing…I was hustling to figure out WHAT would stick, what people wanted and what I was good at. To start with, I had my blog. Curtains are Open began as a hobby and over time, I realized that the stories I was writing had value…I could make money at something I enjoyed. Currently, I make money on my blog through ads on my site, sponsored posts and brand ambassadorships. I’m continuing to grow my readership and have great plans for this space I love…while still keeping it authentic to who I am and only working with brands I truly believe in. I love to write…getting paid to do that is an unbelievable bonus! Second, through blogging, I also helped found and am a partner at ECM Media…supporting other bloggers, sharing knowledge and helping local companies find influencers to work with them on various projects. This is fairly new, ever-changing and extremely exciting. Working with other bloggers and supporting their dreams elevates me and inspires me every single day. I’ve discovered that you learn a LOT from collaborating and sharing…plus, you meet some pretty amazing people along the way! 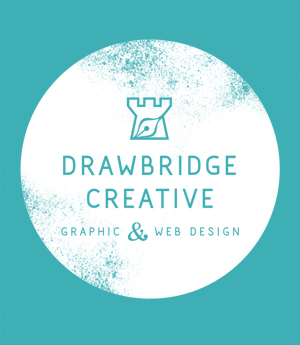 Third, I have Drawbridge Creative…my Graphic Design company. The VERY reason I went back to school and my main business focus has always been my design company. It started slow as I was learning and getting my feet wet…and over the last few years, has grown into something rather fantastic. I’m to the point that I can be rather picky about who I work with and what projects I take on…and it’s thrilling to work in a creative capacity every day with people I truly enjoy. I love being part of the success of other businesses. These three businesses work together, all using my energy and creative talents…all keeping me busy and growing an income while giving me a great sense of pride and accomplishment. Every single day at the office is more exciting than the one before and when things get super busy, I can sit back and smile and realize “I built this” rather than stress about having “too much to do.” I truly enjoy what I do. And then…three years ago, my Dad turned 70. Problem was…I really disliked the design. So, taking the idea, I played, re-played, jigged, re-jigged…until I came up with a design that I loved for my Dad…then, I created a beautiful framed print for his birthday filled with 70 sentiments from various family members and friends. The reaction when I gave it to him was priceless. So I blogged about it…as bloggers do. Over the next year, folks asked for the template and I happily provided it to them…over 1,000 times! It’s in Adobe Illustrator so some people had no issue with it…others came back and asked me if I could do it for them as they didn’t know the software, but, I’d politely explain that I had my blogging business and my design business and I really didn’t have time to re-do the piece for them. IT TOOK A YEAR OF PEOPLE ASKING ME TO MAKE THESE THINGS FOR THEM BEFORE I CLUED IN THAT I REALLY COULD DO SOMETHING MORE!!! So, I started selling the custom pieces through my blog and PayPal…and for the next year, I sold quite a few…always receiving great feedback. That first year, I believe I made around $5,000 in sales…and I was pretty pleased with myself. It was a great addition to the design work I was already doing…adding in a few extra hours on the weekends. However, managing the comments on my blog post, the emails and the payments along with actually doing the work…and running my other businesses…became a bit of a challenge. After months of thinking about it, I finally decided to move the piece over to Etsy and see how that would go. Turns out…I HAD A WINNER! Let me first say, I have a few pieces on Etsy that are of little to no interest to people and have made no sales whatsoever…but this one seems to strike a chord with quite a few. In fact, I spend quite a bit of time requesting that others stop “copying” (straight up stealing) my design…almost becoming a job in itself! People can use the idea…but they CAN’T STEAL MY ORIGINAL DESIGN! That, truly is, the most frustrating thing about creative work. It’s boggling to me when someone just takes what isn’t theirs…and claims it as their own. Truly, it’s a blow financially…but also personally and creatively as well. Anyway, this “70 Things We Love About You” piece has been on Etsy now for two years…the first year doing quite well, and then last year, things went a little nuts. So much so that at the moment, this “side hustle” Etsy piece that brought in a little bit of income each month, has taken over as my main source of income. I work every single day creating “70 Things We Love About You” art pieces as well as “60 Things We Love About You”, “50 Things”, “80 Things” etc. Between answering request, working on pieces, editing pieces, marketing on social media…this little project and birthday gift I gave to my Dad, is paying my mortgage and putting my kids through university. Tips for Turning your Side Hustle into a JOB! So, How exactly do you turn your side hustle into a business? Find your Thing – Make a plan, use your talents and energy to figure out what it is you’re good at and do it! HUSTLE HARD. Make sure it’s YOUR thing, you’re idea…not something you’re stealing from someone else! Be you. Authentic. Genuine. Let your talents shine whatever they are. Network – Attend Networking Events, meet people, be social, get out there, plug your business, make friends…get people to know who you are and learn from those you meet. Support others. Share. Keep trying – Try new things until something sticks. If something doesn’t work, drop it. Move on. Find the next thing. Be Social – Build an Online Presence. Use social media to market yourself and your product while being true to who you are. Treat it like a job – Stop thinking of your creative work as a “hobby” and start thinking of it like a REAL JOB! Find the time – get up earlier, work later, do social media while sitting in the parking lot picking up the kids and RECOGNIZE WHEN YOU NEED HELP with other things like house cleaning and cooking and accounting! DO IT! If there’s something you’ve always wanted to do…do it! About a year ago, I started making money. I’ll be honest, the first month, I thought it was a bit of a fluke. Month two, another fluke. But, by month ten, I’m actually starting to believe that all the hustling to get my name out there and build something I believe in may actually be working! So get out there…DO WHAT YOU LOVE TO DO. Find your thing…and have a bit of fun! Want to help me spread my name on Pinterest? Pin the below picture and share with your Pinterest friends how they can make money off their side-hustle too! Visit my “Things we Love About You” Pinterest Board to see all of the photos people send me…it’s truly a joy to be part of these amazing celebrations! This entry was posted in Graphic Design, Living Creatively, My Own Business and tagged entrepreneur, graphic design by Colleen ODea. Bookmark the permalink. Love this post! Very inspiring, as always, Colleen! Thanks honey! It’s nice to finally be able to breathe a bit and stress less about the financial end of things. Hopefully I can pull everything else together as well! You really never know how much a side hustle can take off! You’re living proof that it’s defintiely worth trying it out! You just never know where it’ll take you. Quite simply, I love this …. a lot! Keep on being amazing!